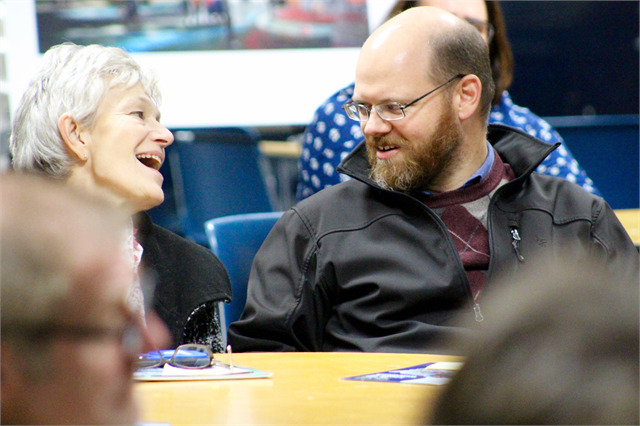 Guests enjoy a laugh while discussing favorite museum experiences during the Wisconsin Historical Society's "Share Your Voice" new museum session Nov. 8, 2018, at the Wisconsin Maritime Museum in Manitowoc. 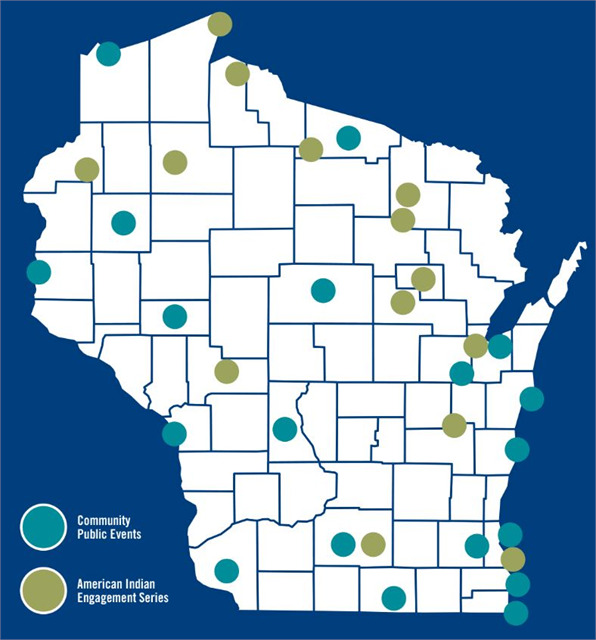 It was the seventh and final session of 2018 for the statewide engagement series, with at least 26 more planned across the state during the first six months of 2019. 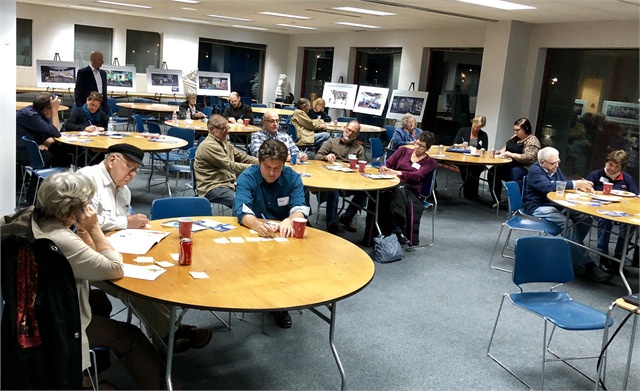 MANITOWOC — The 2018 portion of the Wisconsin Historical Society’s “Share Your Voice” new museum statewide engagement series ended on a high note Nov. 8 with a lively discussion and exchange of ideas at a beautiful setting: The Wisconsin Maritime Museum. The museum highlights Great Lakes maritime history and the star attraction is the World War II submarine USS Cobia, which is connected to the museum. It was donated in 1970 by the U.S. Navy to commemorate the role the city played in building submarines in support of the war effort. Windows overlooking the Manitowoc River and the Cobia added extra inspiration to the session, which was the seventh and final of 2018. 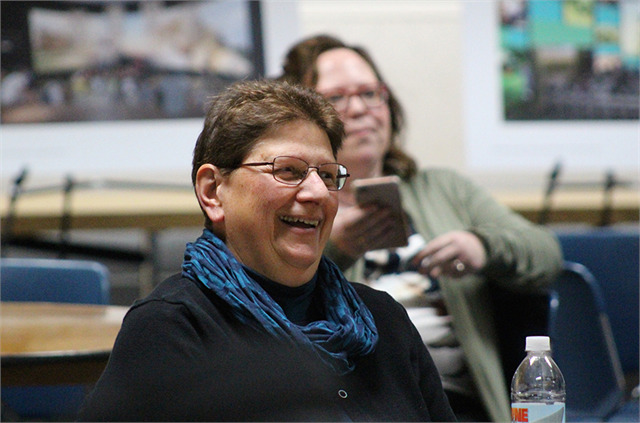 At least 26 more will be held in other parts of the state through June 2019 as the Society continues to gather important local feedback and ideas that will inform the planning for a new Wisconsin history museum. Wisconsin Maritime Museum Deputy Director Cathy Green, co-host of the "Share Your Voice" session, welcomes guests to the Manitowoc museum and talks about its decades-long relationship with the Society. Maritime Museum Deputy Director Cathy Green welcomed guests and highlighted her organization’s longtime association with the Wisconsin Historical Society, especially its maritime archaeologists. “We’ve worked closely with the Society for decades,” Green said. 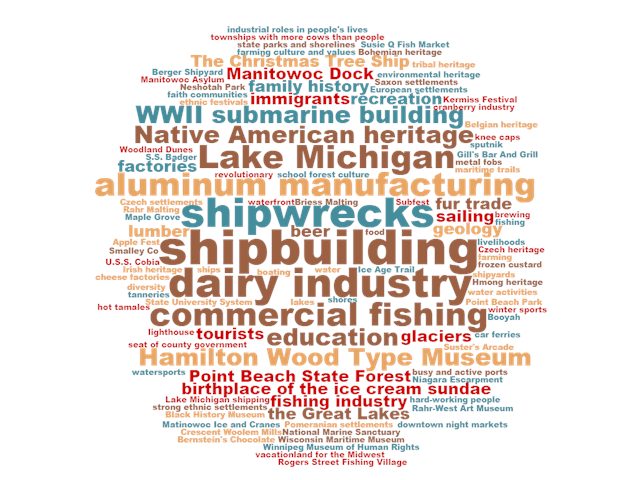 “As stewards of thousands of artifacts from Wisconsin shipwrecks, our relationship with the Society is crucial in how we tell the story of Wisconsin’s maritime history. The archaeological data they gather and the research they undertake really informs how we present the stories of lost ships to the public. 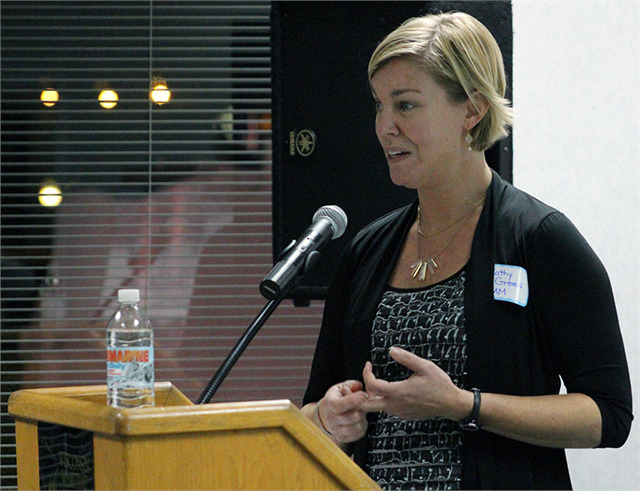 Manitowoc County Historical Society Executive Director Amy Meyer, co-host of the session, welcomes guests. 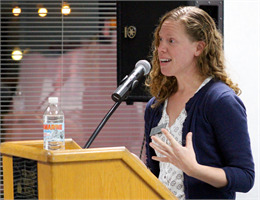 Manitowoc County Historical Society Executive Director Amy Meyer, who co-hosted the event, echoed Green’s sentiments with her enthusiasm for the project. Meyer then introduced Alicia Goehring, the Society’s Director of Special Projects, who led the session. 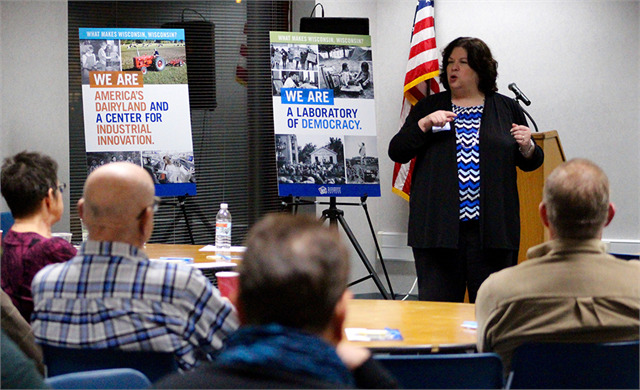 Goehring introduced the project with a video that highlighted the new museum’s overall storytelling theme “What Makes Wisconsin, Wisconsin?” She then engaged guests in workshop-type activities during which they shared topics of local importance and participated in a discussion about their most memorable museum experiences. 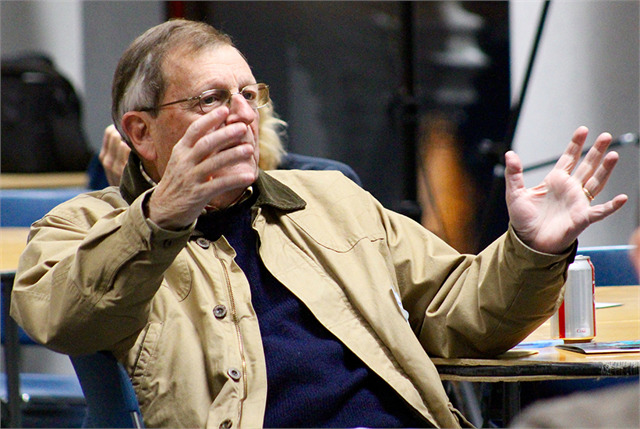 After stickers were placed, Goehring led a discussion asking people to share their thoughts on certain renderings. One of the most popular renderings was titled “Industrial Innovation” (pictured at right), featuring a potential immersive experience in which guests would be able to walk inside a recreation of a massive, 15-foot-tall hydraulic turbine that was made by Milwaukee manufacturer Allis-Chalmers to be used at Niagara Falls. As guests walk through the massive structure, they would learn about Wisconsin’s rich manufacturing history through multimedia projections on the walls. “Industry is a very important part of the history of Wisconsin,” said another guest. 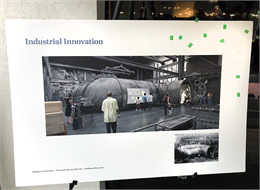 It’s no surprise that the Industrial Innovation theme board also attracted a large amount of Post-It notes from the group, with topics including ship building, submarine building, aluminum manufacturing, shipyards, woolen mills, tanneries, cheese factories, commercial fishing and brewing. As at other engagement sessions, the rendering receiving the most mixed reaction was one of a giant cow sculpture featuring items from all 72 counties. It attracted most of the red stickers from the group. 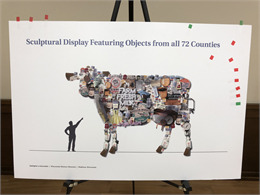 “This cow has been hotly debated throughout the state,” Goehring said with a laugh when opening discussion about it. “There’s just too much going on,” added a man. However, the cow concept did have some supporters. “I like the idea of there being sort of an art installation,” a woman said. Goehring said the woman’s remark touched on a philosophy guiding museum planners. 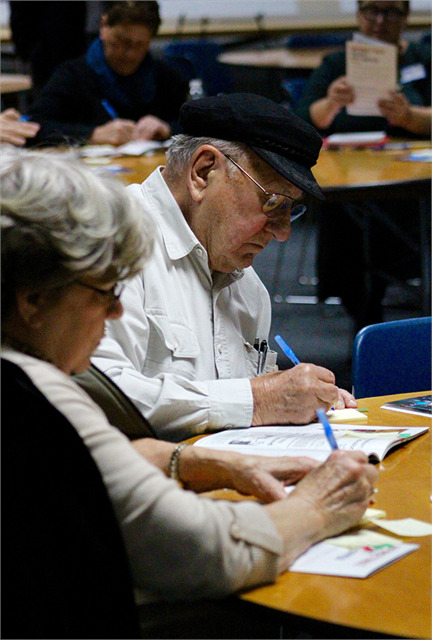 Guests write down their favorite and most iconic Wisconsin memories during the Wisconsin Historical Society's "Share Your Voice" new museum session Nov. 8, 2018, at the Wisconsin Maritime Museum in Manitowoc. The Post-It notes were placed onto "What Makes Wisconsin, Wisconsin?" theme boards along the wall. This word cloud was created from Post-It note suggestions by attendees at the Manitowoc "Share Your Voice" session. 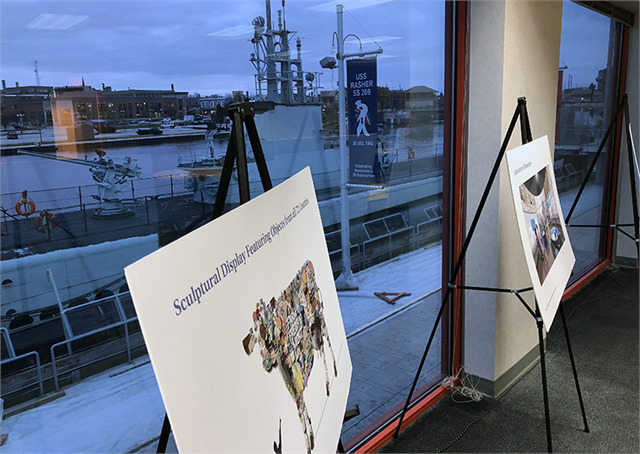 Windows overlooking the Manitowoc River and the World War II submarine USS Cobia, which is connected to the Wisconsin Maritime Museum, added extra inspiration to the session. The vessel was donated in 1970 by the U.S. Navy to commemorate the role the city of Manitowoc played in building submarines in support of the war effort. 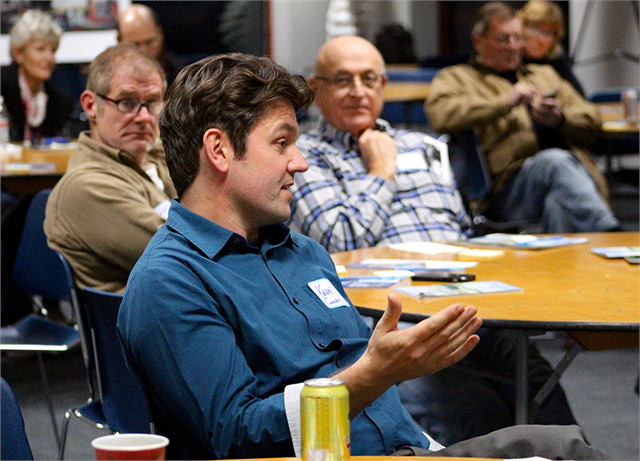 Kevin Cullen, Deputy Director of Green Bay's Neville Public Museum, shares his thoughts during the Nov. 8, 2018, session at the Wisconsin Maritime Museum in Manitowoc. 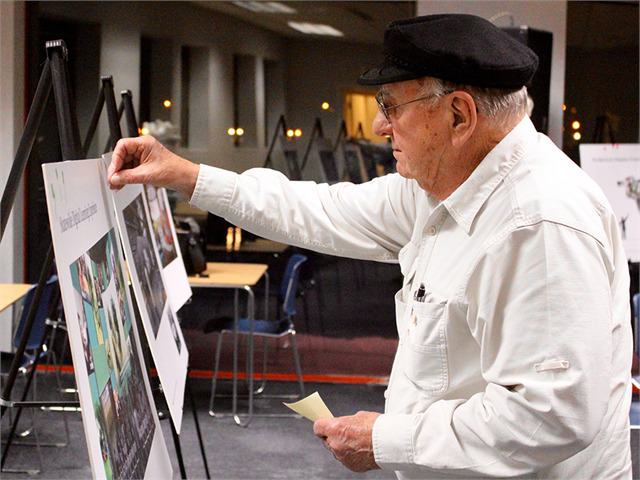 A guest places his preference sticker onto a new museum exhibit concept during the Nov. 8, 2018, "Share Your Voice" session in Manitowoc. A guest places his preference sticker onto a new museum exhibit concept during the "Share Your Voice" session Nov. 8, 2018, at the Wisconsin Maritime Museum in Manitowoc. 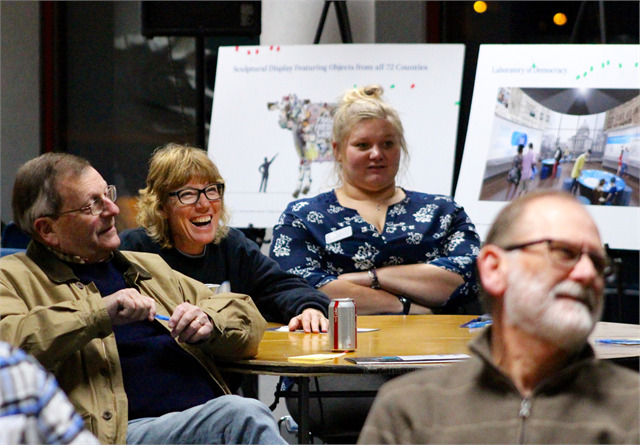 Guests share a laugh while discussing memorable museum experiences during the "Share Your Voice" session in Manitowoc on Nov. 8, 2018. 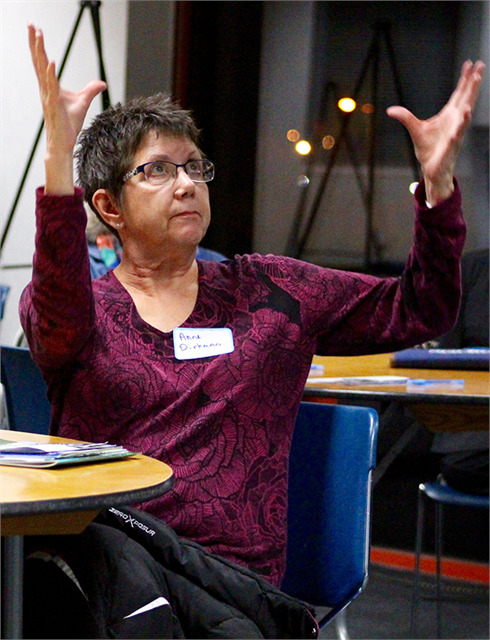 Alicia Goehring, Director of Special Projects for the Wisconsin Historical Society, leads the "Share Your Voice" session at the Wisconsin Maritime Museum in Manitowoc on Nov. 8, 2018. 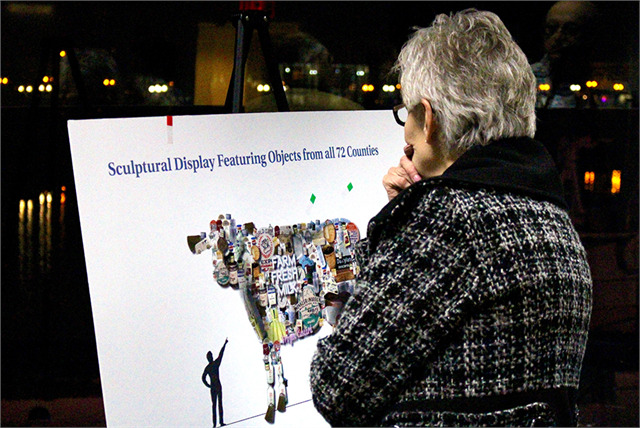 A guest studies the art installation new museum exhibit concept rendering during the "Share Your Voice" session at the Wisconsin Maritime Museum in Manitowoc on Nov. 8, 2018. 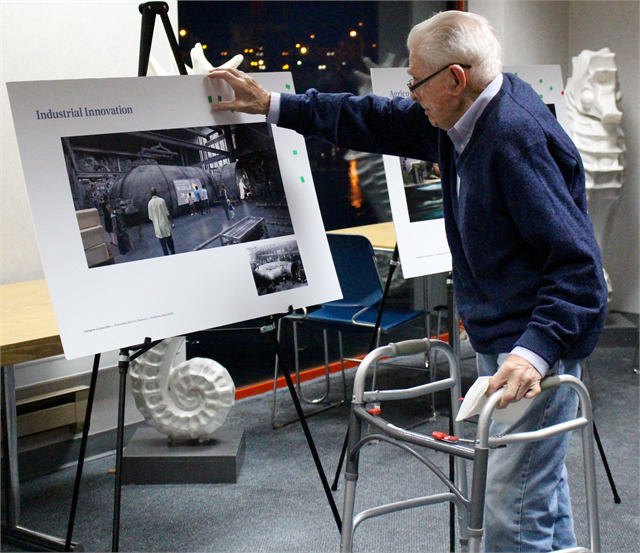 Guests discuss new museum renderings and their favorite museum experiences during the "Share Your Voice" session at the Wisconsin Maritime Museum in Manitowoc on Nov. 8, 2018.
at the Wisconsin Maritime Museum in Manitowoc on Nov. 8, 2018. Attendees write down their favorite and most iconic Wisconsin memories, which were then placed onto "What Makes Wisconsin, Wisconsin?" theme boards during the "Share Your Voice" session in Manitowoc on Nov. 8, 2018. 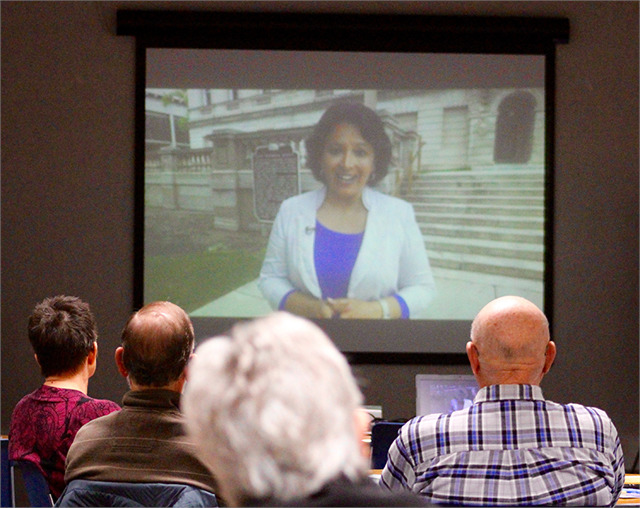 Guests in Manitowoc watch the Society's "What Makes Wisconsin, Wisconsin?" video narrated by veteran Milwaukee television reporter Jessie Garcia. The video highlights the role of the Society and explains the new Wisconsin history museum project.